The Summer Triangle, still high in the south at nightfall, shifts to the west by our map times as our glorious winter constellations climb in the east. Taurus with the Pleiades and its leading star Aldebaran (close to the Moon on the 23rd) stands well clear of the horizon while Orion is rising below and dominates our southern sky after midnight. In the month that should see NASA’s InSight lander touch down on its surface, the planet Mars continues as a prominent object in the south at nightfall. Venus springs into view as a spectacular morning star but we must wait to see whether the Leonids meteor shower, which has produced some storm-force displays in the past, gives us any more than the expected few meteors this year. InSight is due to land on the 26th on a broad plain called Elysium Planitia that straddles Mars’ equator. There it will place an ultra-sensitive seismometer directly onto the surface and cover it with a dome-like shell to shield it from the noise caused by wind and heat changes. This should be able of detect marsquakes and meteor impacts that occur all around Mars. Other InSight experiments will hammer a spike up to five metres into the ground to measure Mars’ heat flow, and further investigate the planet’s interior structure by using radio signals to track tiny wobbles in its rotation. Until recently, Mars has remained low down as it performed a loop against the stars in the south-western corner of Capricornus. That loop, resulting entirely from our changing vantage point as the Earth overtook Mars and came within 58 million km on 31 July, took Mars more than 26° south of the sky’s equator and 3° further south than the Sun stands at our winter solstice. Now, though, Mars is climbing east-north-eastwards on a track that will take it further north than the Sun ever gets by the time it disappears into Scotland’s night-long twilight next summer. One by-product of this motion is that Mars’ setting time is remarkably constant over the coming months, being (for Edinburgh) within 13 minutes of 23:42 GMT from now until next May. This month sees Mars leave Capricornus for Aquarius and shrink as seen through a telescope from 12 to 9 arcseconds as it recedes from 118 million to 151 million km. Its path, indicated on our southern chart, carries it 0.5° (one Moon’s breadth) north of the multiple star Deneb Algedi, the goat’s tail, on the 5th. It almost halves in brightness, from magnitude -0.6 to 0.0, but its peak altitude above Edinburgh’s southern horizon early in the night improves from 16° to 25°, though by our map times it is sinking lower towards the south-west. Mars is not our sole evening planet since Saturn shines at magnitude 0.6 low down in the south-west at nightfall. It is only a degree below-right of the young Moon on the 11th and sets more than 90 minutes before our map times. The two most distant planets, Neptune and Uranus, are also evening objects and may be glimpsed through binoculars at magnitudes 7.9 and 5.7 in Aquarius and Aries respectively. Edinburgh’s sunrise/sunset times vary from 07:19/16:32 on the 1st to 08:17/15:45 on the 30th. The Moon is new on the 7th, at first quarter and below-right of Mars on the 15th, full on the 23rd and at last quarter on the 30th. Jupiter is hidden in the solar glare as it approaches conjunction on the Sun’s far side on the 26th. Mercury stands furthest east of the Sun (23°) on the 6th but is also invisible from our northern latitudes. Venus, though, emerges rapidly from the Sun’s near side into our morning twilight where it stands to the left of the star Spica in Virgo. Shining brilliantly at magnitude -4.1, the planet rises in the east-south-east only 29 minutes before the Sun on the 1st. By the 6th, though, it rises 80 minutes before sunrise and stands 8° below and right of the impressively earthlit waning Moon. Venus itself is 58 arcseconds wide and 4% illuminated on that morning, its slender crescent being visible through binoculars. By the 30th, Venus rises four hours before the Sun, climbs to stand 23° high in the south-south-east at sunrise and appears as a 41 arcseconds and 25% sunlit crescent. It is just as well that my previous note led on the usually neglected Draconids meteor shower because observers, at least those under clear skies, were thrilled to see it provide perhaps the best meteor show of 2018. For just a few hours around midnight on 8-9th October, the sky became alive with slow meteors at rates of up to 100 meteors per hour or more. Leonid meteors arrive this month between the 15th and 20th, with the shower expected to hit its usually-brief peak at around 01:00 on the 18th. 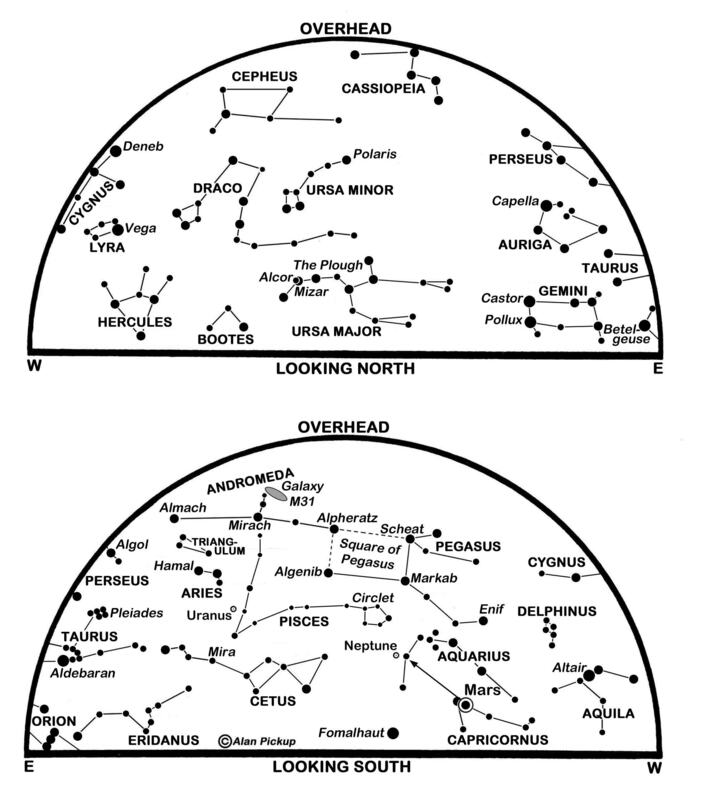 Although they flash in all parts of the sky, they diverge from a radiant point in the so-called Sickle of Leo which rises in the north-east before midnight and climbs high into the south before dawn. No Leonids appear before the radiant rises, but even with the radiant high in a dark sky we may see fewer than 20 per hour – all of them very swift and many of the brighter ones leaving glowing trains in their wake. Leonid meteoroids come from Comet Tempel-Tuttle which orbits the Sun every 33 years and was last in our vicinity in 1998. There has not been a Leonids meteor storm since 2002 and we may be a decade or more away from the next one, or are we? This is a slightly revised version, with added diary, of Alan’s article published in The Scotsman on October 31st 2018, with thanks to the newspaper for permission to republish here. Posted on 31/10/2018, in Uncategorized and tagged Alan Pickup, ASE, Astronomical Society of Edinburgh, Comet Tempel-Tuttle, diary, Draconids, Jupiter, Leonids, Mars, marsquakes, Mercury, meteor shower, moon, NASA InSight, Neptune, Night Sky, Saturn, Scotland, Summer Triangle, The Scotsman, Uranus, Venus. Bookmark the permalink. Leave a comment.